Lo Dubs have established themselves as the leading imprint of the USA's emerging dubstep community. 05. XI - "G Funk-3000"
06. DZ/XI - "Guns At Dawn"
07. South3rn - "Fully Loaded"
10. Pacheko - "Bi Polar Bear"
14. 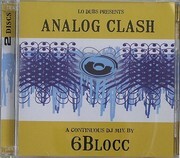 6Blocc - "Give The DJ A Break 2008"
15. Cardpusher - "Milk Thistle"
05. South3rn - "La Rana"
07. Bombaman - "Rise Against"
11. South3rn - "Fully Loaded"